Tonight, Sidney Crosby, the young superstar in the NHL, made his long awaited return to the ice for the Pittsburgh Penguins. For almost 11 months it has been debated that Sid the Kid might never return after suffering two big concussions within five days of each other in early January. 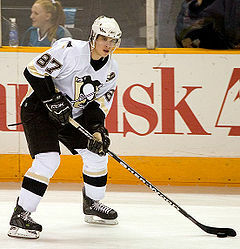 But tonight Crosby came back in a game against the New York Islanders. It was speculated if Crosby would be anywhere close to his old form. Crosby shut up the critics very quickly. Crosby scored two goals and grabbed a pair of assists to get four points on the night. The Penguins won the game 5-0, meaning that Crosby was involved in four of the five scores of the night for his team. The 24 year old NHL MVP and Stanley Cup Champion turned his team into a Stanley Cup favorite once again in literally a matter of minutes as he showed that he is still as sharp as ever, if not better. Crosby played just under 16 minutes and took 8 shots on goal. He also won 7 out of the 14 faceoffs he was in. The Penguins lead the Eastern Conference and with Crosby are expected to simply dominate all of the NHL.